Do you struggle with finding more ways to serve vegetables or provide grain-free lunches? If so, you are not alone. Each week, dozens of parents e-mail me, struggling with ways to make veggies more fun. To help you, I’ve brought in my friend, Ali, from Inspiralized. The recipe is great for dinner or as a healthy school lunch. For more ideas like this, visit our grain-free meal plan. Do you constantly struggle with preparing meals for your kids that you don’t feel guilty eating? Trying to stay fit but can’t resist chicken fingers, buttered pasta, and mac n’ cheese? 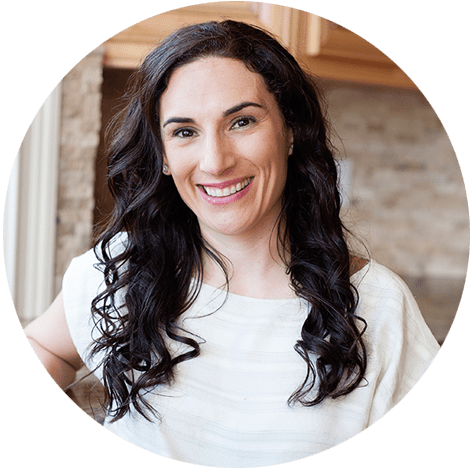 Are you having trouble finding the time to cook healthy meals for your family? What does spiralized mean? Spiralizing is using the kitchen countertop tool called the “spiralizer” to turn vegetables into noodles. Once you have spiralized a vegetable into “speggies,” the options are endless: soups, pastas, noodles, and even sandwich buns and pancakes! 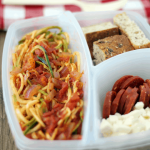 By replacing regular pasta and noodles with speggies, you are not only sneaking extra vegetables into your child’s diet, but you’re creating meals that are low-carb, low-fat, and low-calorie to help us grownups keep our figures. Spiralizing a vegetable takes less than 30 seconds! No more waiting for the water to boil, and no more mushy noodles. The best part about this new method of cooking is that you can make speggies with your kids, because they love the magical experience of taking a vegetable and turning it into noodles! If you need step-by-step picture tutorials on how to spiralize, click here. To help you get started in putting your speggies into a recipe your kids will love for dinner or lunch, I’ve paired two kid favorite flavors: pizza and spaghetti. This simple recipe can be enjoyed by a family and then used as a leftovers lunch the next day—talk about time-saving! Who doesn’t love pepperoni pizza and spaghetti? 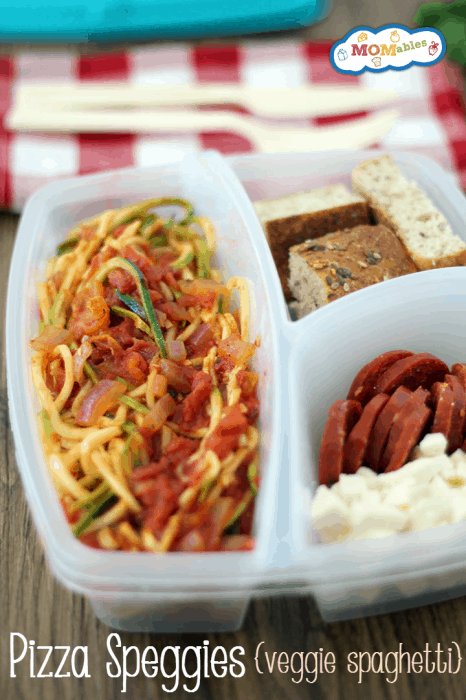 Place the zucchini noodles, pepperoni, mozzarella, and bread into lunch box compartments. Heat up the marinara sauce in a saucepan or microwave. Pour the marinara sauce over the zucchini pasta and serve. 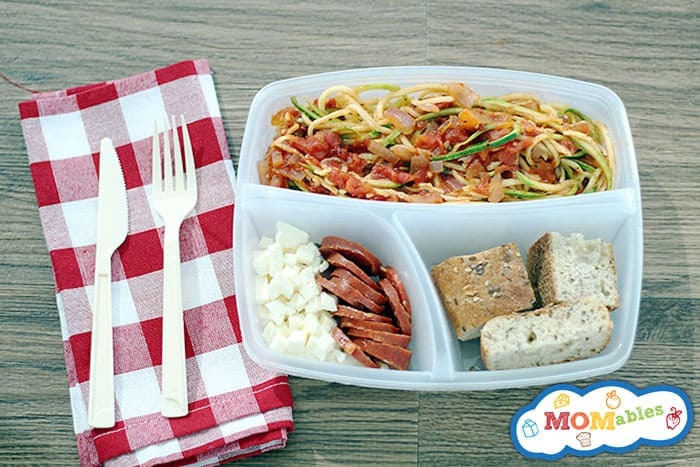 Let your child create his/her own pizza, using the toppings in the lunch box compartments. Try this link now. Sorry! can you tell us what container you are using in this picture? Maris, it’s this one. You can find all the lunch containers I like here. The zucchini is served just like that raw??? I heat up the tomato sauce very hot and it sort of steams it. Zucchini doesn’t have to be cooked a lot, especially since you are spiralizing it very thin. If you are concerned and want to soften it up, sauté it first. The link to whatever the spiralize thing is – says page not found? thank you MelAnn, it’s fixed!